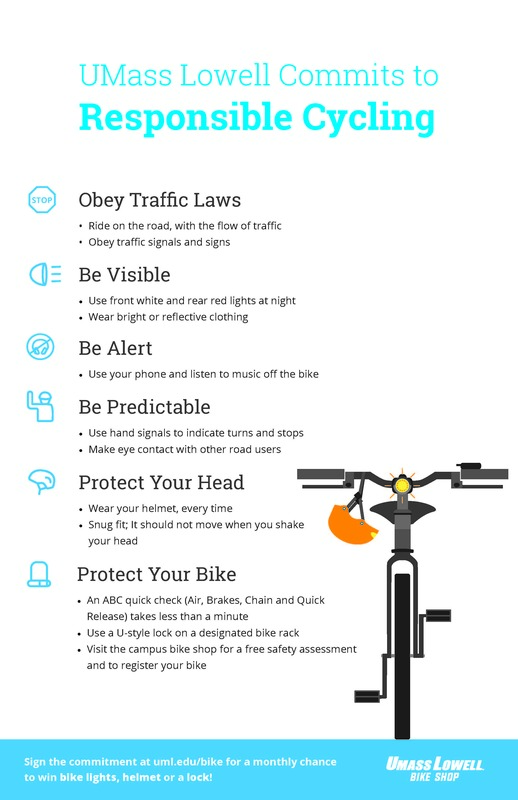 Print the Bike Safety Poster for your office or residence hall! Bicycling is currently growing in popularity at UMass Lowell. Our goal is to foster a culture of responsible cycling during a time when habits are forming for maturing riders. A responsible cyclist follows the law, is considerate of others, communicates with others on the road, is conspicuous, predictable and utilizes appropriate equipment to ensure the safety of themselves and others. We've developed a commitment to responsible cycling and want to invite you to join us. Make the commitment online yourself! Learn more about responsible cycling by exploring our site, instructional and group ride offerings. The Education and Safety page is meant as a shared resource for the UMass Lowell community as well as anyone else looking for a way to improve their cycling knowledge and safety. If there's something you would like us to add please email Kevin Soleil with comments and suggestions.